Scarlett Johansson ("The Island"), Jonathan Rhys-Meyers ("Bend It Like Beckham"), Emily Mortimer ("Lovely & Amazing"), Matthew Goode ("Chasing Liberty"), Brian Cox ("The Bourne Identity,", "The Bourne Supremacy") and Penelope Wilton ("Iris," "Calendar Girls") star in "Match Point," a new dramatic thriller from writer/director Woody Allen. 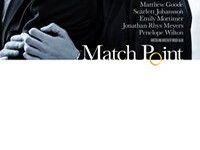 "Match Point" is a drama about ambition, the seduction of wealth, love, and sexual passion. Perhaps most importantly, however, the story reveals the huge part luck plays in events, refuting the comforting misconception that more of life is under our control than really is. Written and directed by Academy Award® winner Woody Allen ("Annie Hall," "Hannah and Her Sisters"), "Match Point" represents a departure for the native New Yorker, the majority of whose films lovingly depict New York and—not always so lovingly—New Yorkers. Crossing the Atlantic for the first time in his film career, Allen set "Match Point" in London, where it was also filmed.